How Are Design Systems Being Used? I’m a big fan of systems! In my own work design systems have made it easier to make small design choices, focus on the overall experience, and collaborate more easily with developers. If you’re anything like me, you may have found yourself looking for resources to better understand, create and share design systems — in that process, you may also have found that there is a very diverse and overwhelming amount of tools, best practices and information on this topic. This made us wonder. How are others in day to day practice working on design systems? Who is actually using design systems? How are smaller teams taking all of this guidance into their work? What’s working well? What isn’t? In casually talking to designers about their experience, a theme began to emerge —design systems seem promising, but are often described as the luxury of larger teams with long timelines and abundant resources. Why is this the case? What do design systems mean to teams? What tools are being used to support them? What’s working well in using systems? What isn’t? To better explore some of these questions, we set out to survey and learn from the community. We heard from 55 digital product designers in the process. While this is a good cohort size to begin to unearth larger trends, it’s not big enough to be representative of the larger community. Nonetheless, the difficulty in being able to gather more data was a helpful learning and indicator of its own – at the time of this survey, it’s hard to find designers actively thinking about and interested in design systems. Below are some of our findings and larger themes that emerged. Many of the designers we heard from work on cohesive, related products within a single company. A large portion (40%) work in smaller teams of 2–5 designers. Looking to glean how designers understand what constitutes a system, we asked respondents to describe the typical UI elements they reuse in their projects. The responses were stripped of stop words. Below is a word cloud representation, with scale denoting response frequency. 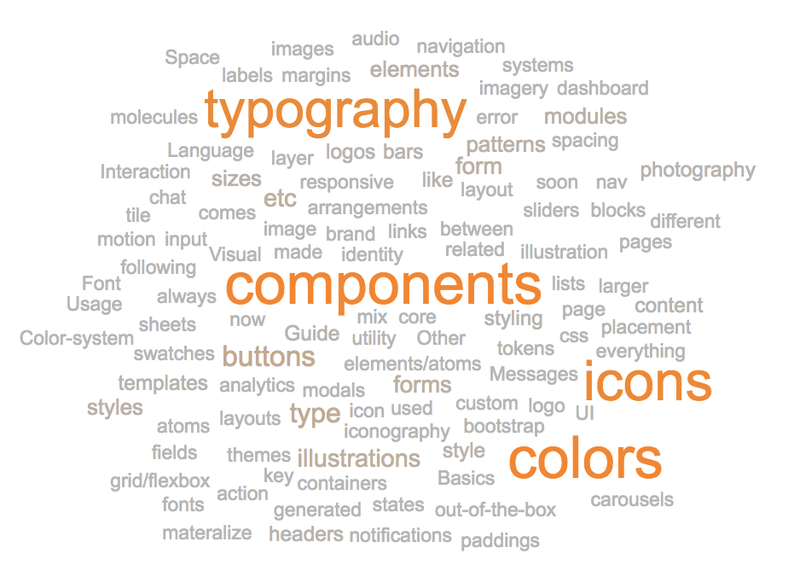 Components, icons, colors and typography were the most commonly mentioned elements. Do Designers Work Using Systems? We asked designers this question directly, while leaving out a strict definition of “design system.” We provided a few versions of “Yes” and “No” responses to choose from (Yes — I maintain and extend an existing system, Yes — I create my own design systems, No — there’s another designer or team responsible for creating and maintaining a design system, No — I prefer to work quickly without a formal system). 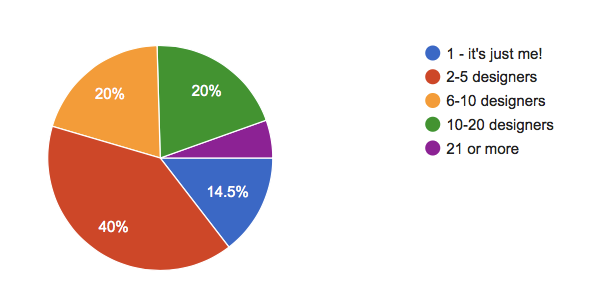 We also gave respondents the ability to provide their own response. Most respondents (76.4%) answered a form of “Yes”, though it is worth adding that — perhaps in this question more than any other — there is likely significant sampling bias in the self-selection of a voluntary, design systems survey. Another really interesting observation here was the variety of added responses used to describe respondents’ particular practice of applying systems. 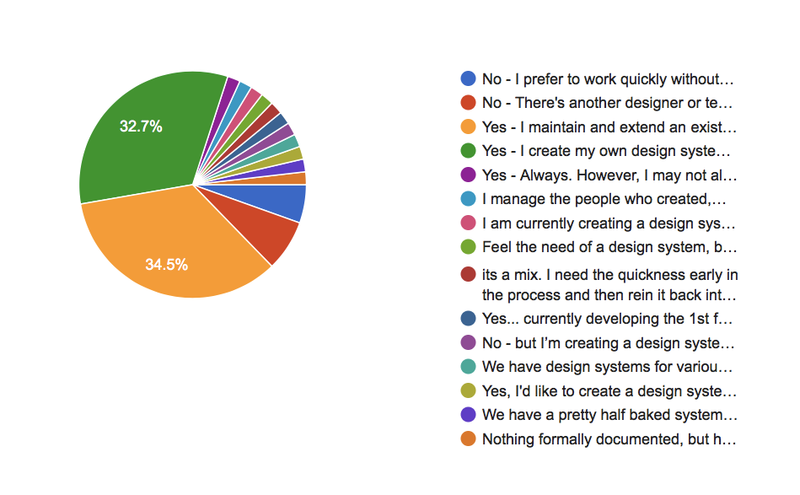 To help up-level the diverse responses above, we sorted through each answer and separated them into more distinct categories of “Yes,” “No” and “Other” (to account for responses like “I manage the people who create systems”). Looking at the responses in these buckets, 76.4% of participants said that “Yes,” they currently use systems in some form. 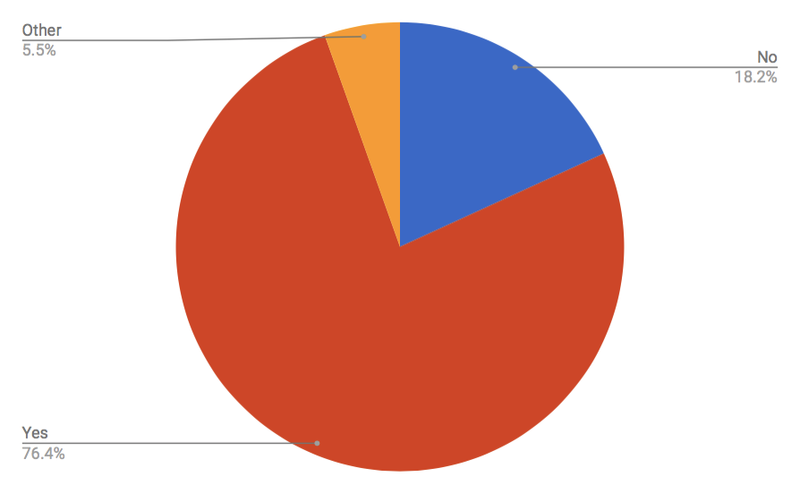 Further breakdown of the above data let us sort the “Yes” and “No” responses into more explicitly descriptive buckets. Many respondents (41.8%) said they create their own design systems, followed by those who extend an existing system (36.6%). We also asked designers what tools they actively use for creating and maintaining design systems. 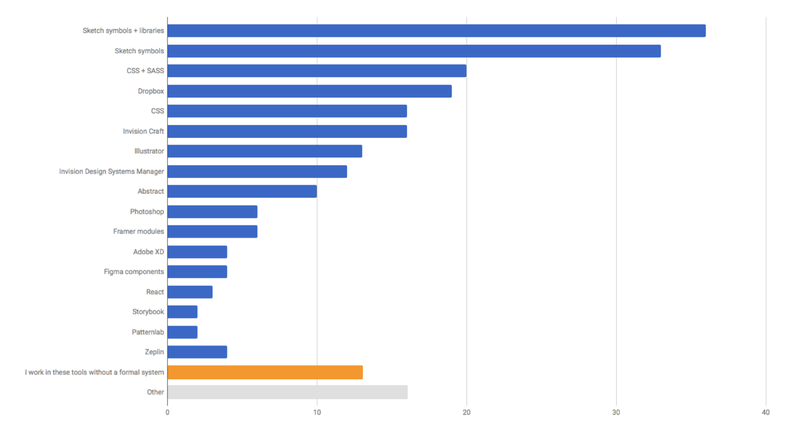 Sketch symbols and libraries were the most commonly used, followed by CSS + SASS. It was interesting to observe that although a less frequent answer, working in design tools “without a formal system” was still relatively significant. Lastly, in what is perhaps an opportunity to improve this survey in the future, users were allowed to add their own multiple choice responses. While outliers, the addition of responses like “Notebooks (hand written)” are indicative of a core issue of design systems — their definition is interpreted very fluidly, to the extent that it removes the utility of a system as a forcing function within a team. The intent with allowing flexible answers was indeed to capture the variety of meaning, but a takeaway from this data is that a more strict definition should be added in a follow-up survey, to dig deeper into the specific usage of current tools. Finally, we also asked designers to share their general opinions on design systems, what’s working well, what isn’t, and what could be improved. Below are some takeaways from what they shared. As teams are scaling design in Agile environments, designers are starting to see the benefit of investing in creating systems. While design systems remain an early prospect for some teams, dedicated champions of systems are the way to disseminate their value and establish best practices. Collaborating with developers is key to the success of design systems; having active support from engineering is an important part of the process. Once established, design systems become a central reference point for teams, enabling better distribution of patterns and establishing common language for components. In addition to improved clarity, the consistency created enables designers to work faster as they pull from common guidelines. Successful systems are designed and developed iteratively, and are a living representation of components that changes over time. Teams that have succeeded creating design systems involve cross-disciplinary teams early on, encouraging others to actively contribute to its shape and language. Creating an artifact that manages process across teams is an effort that requires cross-functional conversations about benefits, best practices, and workflow. A lack of clear tools and methods can make convincing others more difficult, leaving designers to shoulder much of the burden on their own. At the heart of design systems are people. Ultimately, the way systems are built and how they are used is enabled by what is also their most important outcome — better communication and process. It is no surprise then that this is one of the toughest and most elusive barriers to creating systems. Given the myriad tools and approaches to design systems, the daunting process is but one part of the challenge — where and how to capture the holistic system is a big question for designers. In making the case for design systems, teams need to balance the amount of time spent creating them with the sometimes unclear value those systems could bring. This can be a non-starter when the practice of building systems isn’t yet widely adopted or understood. Further, teams need to allocate time for maintaining a system as products evolve. Perhaps few feel this more than consultancies or agencies, who often cite not having enough time as the biggest reason for not building systems. There also seems to be a perception that creating systems restricts the ability to work creatively, and can prevent new and innovative design from challenging existing patterns. Distributed methods and assets can make design systems difficult to scale in large teams. Interestingly enough, similar challenges are echoed in small teams, where system decisions might be less collaborative and more siloed. In the midst of impending deadlines or a big product release, design or development work that isn’t directly seen by customers can quickly be de-prioritized. It’s easy to see how design systems work can be akin to any refactoring or cleanup efforts—unless perceived as mission critical, they can quickly be forgone. Ultimately, the biggest hurdle to designers seems to be a lack of established best practices, refined tools, and general guidance. When faced with a lack of time, team buy-in, and unclear resources, it’s no wonder designers sometimes opt-out of creating systems altogether. A lack of close collaboration with developers or knowledge of development patterns is also a likely challenge in designing “componentized,” scalable systems. It’s clear that there’s a lot of room for improvement in how we create and share design systems. 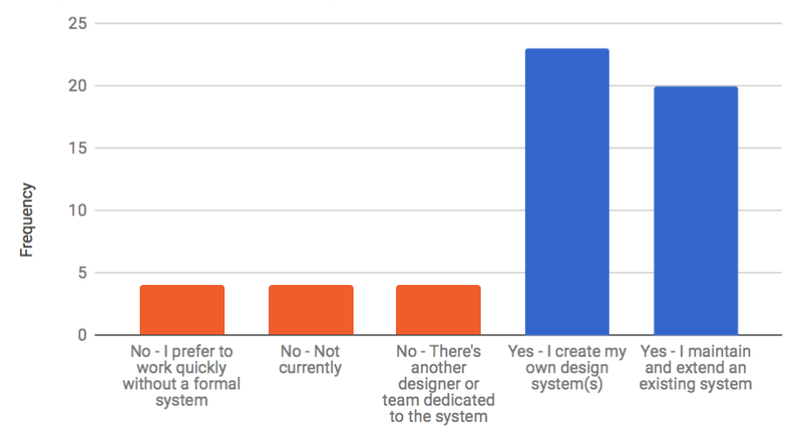 From the survey, a few key areas stood out as best practices to support design systems and the teams using them. Moving forward, a number of products out there (Sketch libraries, Invision Studio, Abstract, Adobe XD, Figma, etc.) are already working on better ways to support workflow and collaboration. It still stands, however, that while tools will make this easier, success will come from the processes and shared communication we establish in our teams. A design system is, after all, only the output of strong workflow and a collaborative, streamlined team working together. Start reading and learning about design systems. There are tons of resources out there on how design systems work, and how you can get started — below are just a few. Talk to your team about design consistency and communication in your projects, any challenges you see, and how you might begin working together to solve them. Start the conversation and keep it going. Begin experimenting with systems in a subset of your design work — try creating components on a new feature or screen you’re tackling. Continue to work iteratively on the components and start sharing some of that work and process with your team. Stay tuned! Tools and processes are actively evolving. Let us know what you think! Are you actively using design systems? What’s working for you? What isn’t? A methodology for creating design systems using atoms, molecules, organisms, templates and pages.